My first venture into the world of i-publishing resulted in the publication of "At the Beach with Bucket and Spade" on the Apple iTunes App Store via i-publisher istorytime.com. 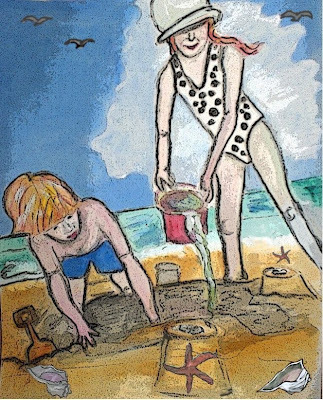 The illustrations were done by Sarah E. Bash Gleason in a naive style in keeping with the theme, a family outing to the beach on summer vacation. The rhyming story is narrated by the children themselves. Summer holidays from Manly to Maroubra, from Palm Springs to to Waikiki mean family fun in the sun! Part of the fun is looking for that special treasure to take back to class for Show and Tell! 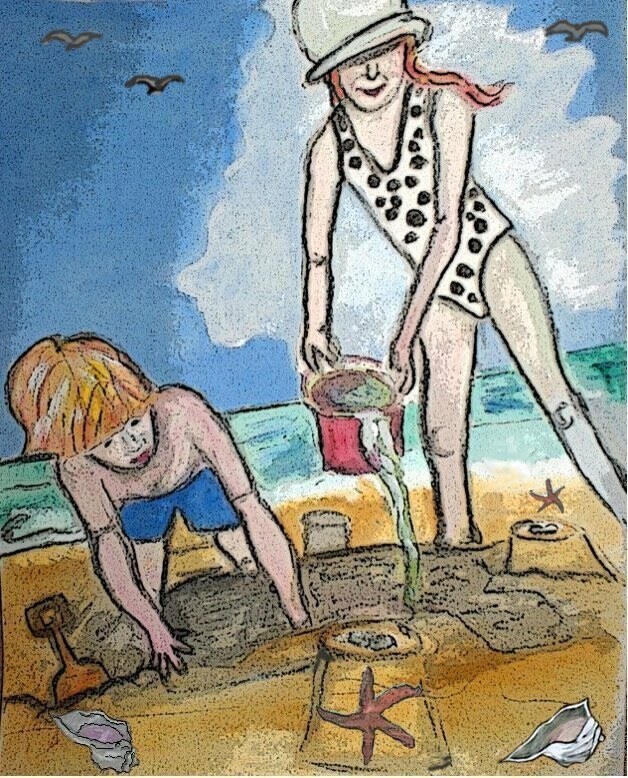 The children in this narrative poem, celebrate all that is best in a beach holiday outing. They play, they build, they share, they learn life's little lessons together and they find that something really special that happy memories are made of! The illustrations have been tailored by Sarah E. Bash to fit the theme using the naive style of a child's holiday memories painted in class. Great playful book that really captures the spirit of young children. This story is great for children! The chalk-style artwork is very unique and very creative. My daughter especially likes this book. 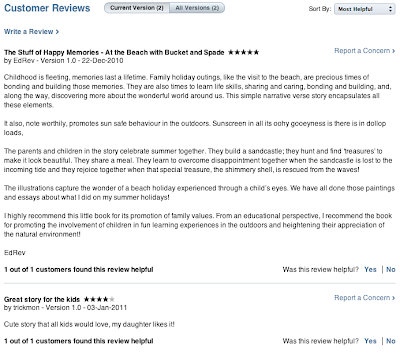 A peaceful, gentle book filled with all the warmth of childhood days at the beach. The book expresses the process of learning to prepare for the strong rays of the sun by putting on a sunhat as well as sun block. The illustrations are soft and dreamy, a use of color and gentle lines that feel like a cool dip in the ocean on a hot sunny day. Text that sweetly rhymes, yet at times breaks from rhyme in a barely noticeable way, keeping a beat of it’s own that is as natural feeling as a heartbeat. At times the writing runs separately beside the illustrations; in white space, while other times over the illustrations, and at times the text is placed in a way that speaks of the pictures it runs across. The deviation away from a set pattern of organizing text and illustrations, or consistently rhyming or not rhyming, is part of the magic that reaches out. There is a natural talent at play here that creates poetry of its own kind. Perhaps reflective of a mother and daughter creative compatibility that resulted in the making of this book, by JR Poulter, Author, and Sarah E. Bash, Illustrator. Poulter and Bash are both mothers with children who are able to share loving family moments captured in these wonderful illustrations and beautifully woven words. The message, if any were to be derived, beyond reading about a family day out, so simply and warmly conveyed, could be the joy of building spectacularly in life, enjoying various pleasures, accepting impermanence, inevitable loss, and giving focus to what there is to be grateful for in each moment. And to tell you anymore would give the story away. Read and enjoy this lovely book with your children!